Help us kick-off our Library 12 Days of Christmas! 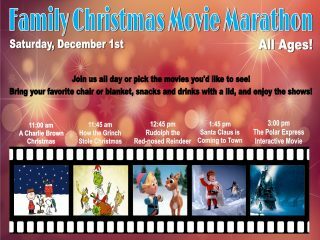 Join us for a marathon showing of some Christmas movie favorites! 1:45 pm – Santa Claus is Coming to Town. 3:00 pm join us for an interactive version of The Polar Express. Bring a comfy chair or blanket, bottled water, soda or juice boxes with a lid and your favorite snacks. Registration is not required.